The Catholic Schools in the Diocese of Covington provide a challenging and innovative curriculum for students from preschool through high school. In addition to the core subjects of religion, science, math, language arts, social studies, computer applications and fine arts, schools offer programs for the gifted and challenged students. All of our schools strive to meet the needs of the individual student. Every school in the Diocese of Covington is certified by the Kentucky Board of Education. Students in the elementary schools of the Diocese of Covington in grades 2, 3, 5 and 7 are tested annually using the TerraNova, Third Edition which is published and scored by Data Recognition Corporation|CTB. Some schools make the local decision to test students in other grade levels. The main purpose for using the TerraNova3 norm-based reference test is to assess the strengths and weaknesses of the individual student and to analyze curriculum strengths and deficiencies. Our High Schools participate in the ACT District Choice program. By participating in this program our students take the ACT during the spring of their Junior year. Please click here to review our 8-year trends for the ACT in our diocese with a comparison to the state scores. *Catholic high school graduates receive millions of dollars in SCHOLARSHIPS. *Many Catholic school students receive NATIONAL MERIT recognition for academic excellence. *Catholic school students consistently test in the UPPER PERCENTILES on achievement tests and college admissions exams. The scores shown in the table are national percentiles. A national percentile shows the percentage of students whose scores fell below the reported score. For example, a 76 (NP) received by a student indicates that 75 out of every 100 students in the national norm group scored below that score for students . It also means that 24 out of every 100 students scored above that score for students. Along with Nation Percentile (NP) scores, another important indicator is the Obtained Achievement Score verses the Anticipated Achievement Score. 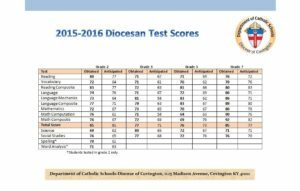 The average scores for students in the Diocesan elementary schools resulted in the obtained score meeting or exceeding the anticipated score in all but two content areas of the test. Anticipated scores are based on the InView Cognitive Abilities Aptitude Test. This test offers a prediction of how well a student will perform on various components of the TerraNova3.